"Sales of existing homes fell 14 percent to 1,981 compared to the same month last year, according to the Austin Board of Realtors. It was the highest number of sales so far this year, indicative of the seasonal increase seen during spring and summer months. The median price was $187,900, inching up 2 percent from last year." I always find articles like this to be very interesting. They are using statistics to draw conclusions but their conclusions are based on their viewpoint. At first glance it appears that people are buying and selling less homes this year than last year. 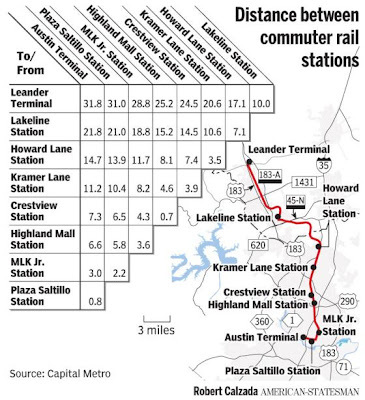 Does this mean that less people are moving to Austin? No. Are less people moving up to different neighborhoods? Maybe. 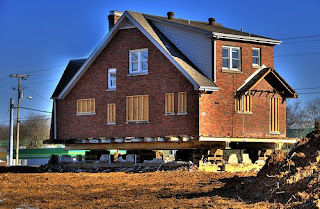 Or does it means there are simply less volume of homes that are being bought or sold this year than last? It doesn't explore the cause of why that could be. What do you think? I think it has a lot to do with the sub-prime fallout and strict mortgage qualifications that have been effecting home sales or the last 8+ months. Austin and its surrounding areas are doing much better than other cities in the nation. Houses are still selling and people are still buying. The difference between this year and last is that people hear a lot of negative, national real estate news that says now is a horrible time to purchase a home. The truth is that now is a great time to buy a home. People that are financially stable and are able to qualify for funding, can get a great deal on a home. The seller of that home can in turn, get a great deal on the purchase of the home they will then purchase and so on. Prices overall are still rising. Make sure that when you read a headline like this to think about what it really means. Less buyers overall=less sales overall. Finding the cause is simple and there is a basic relationship between the buyer pool and # of overall sales. Let me know what you think in the comment section. "...homes in her price range that are sent to her automatically from her agent's Web site. When she sees something interesting, her agent sends her the full listing. Rarely do they speak on the phone." In todays Real Estate marketplace, the internet is a great vehicle for interactioon between a REALTOR and a home buyer or home seller. I use automated searches for my clients that are in the market for a home. I ask questions of the home buyer to find out exactly what they are looking for and develop a list of criteria and set up an MLS search that finds homes that meet their criteria. When new listings come on the market, clients are updated with the new information sent directly to their email. 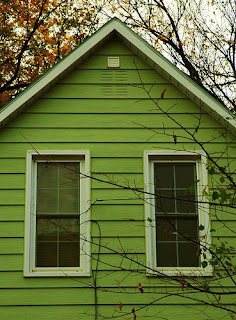 If something looks interesting, we set up a time that works for them and we see the homes in person. I am suprised when I get phone calls from my listings that already have a pending contract. By law, I am required to ask if they are working with an agent. If they say yes, it makes me wonder what has happened. Does the agent not know how to set up a search that alerts a client when a property is new on the market? Why would a buyer work with an agent like that? In some areas, homes are on the market less than two weeks. If a buyer can be notified quickly when a new property is available, they will be able to react quickly. For sellers, I get feedback from agents that bring their clients to my listings and ask questions about their opinion and the prospective buyers opinions of the home. This helps my client, the seller, make any nessisary changes that they have not already made and may bring to light any concerns of a prospective buyer. If the concern is a misunderstanding of some kind, I can contact the agent and explain what is going on. If you are thinking of buying a home get in touch with me and I can set up a search to help you find the perfect home. Posted by Brian Martin. Brian is a REALTOR with the Pinnacle Group of Keller Williams. Brian embraces technological advances in Real Estate that allow them to find the perfect home. "Austin Board of Realtors said energy-efficiency audits should be performed when the name on the home's utility bill changes and space would be provided to specify energy audit results on seller's disclosure forms. Any upgrades would be voluntary, with city incentives such as sales tax exemptions on the materials needed." This is just an update about the energy efficiency audits that the city of Austin has been talking about implementing upon older homes. The new proposal was brought forth by the Austin Board of Realtors and I think it is structured a little better than what the working proposal is. Under the ABoR proposal, The homes would still be updated but it wouldnt be a stipulation of the sale of the home. It also has ideas about how there would be tax incentives for sellers that choose to do the updates before selling the home. If this were the case, it would also be a selling point for a home that had already been updated because the prospective buyer would not have to deal with it. This is an update of a previous post that you can read here. I will update again as more information becomes available on this topic. 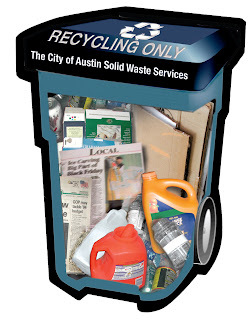 The city of Austin is introducing a program that they call "single stream" recycling. The program will be implemented in Fall '08. The city will deliver new 90 gallon bins to homes and the list of materials that will be accepted has expanded so now we will be able to recycle more of the products we use all in the same bin. What goes in the recycling cart? I think this is a big step in the right direction. The city of Austin is seen as a "green" city and these are the types of programs that enforce that reputation. If we can make it easier for people to recycle, what reason do they have to waste by just throwing recyclables in the trash? 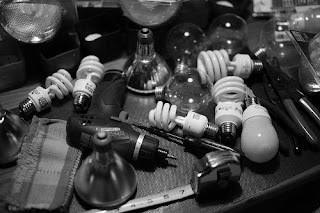 My wife and I recycle as much as we can and it really cuts down on the amount of trash we put in our bin. Since we will be able to recycle more products, the next step for the city should be to deliver smaller trash bins to encourage people even more to recycle. What do you think about this program?